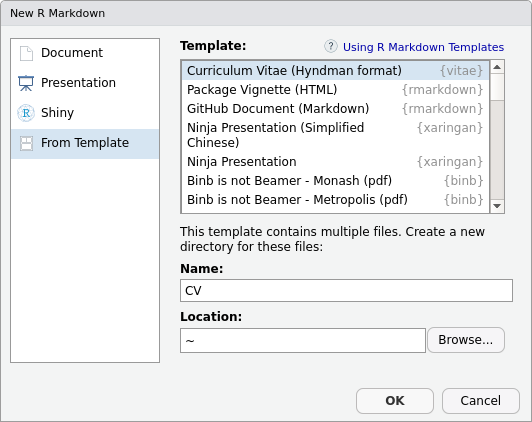 The vitae package makes creating and maintaining a Résumé or CV with R Markdown simple. It provides a collection of LaTeX templates, with helpful functions to add content to the documents. You can install the release version from CRAN. You can install the development version from GitHub. The vitae package currently supports 4 popular CV templates, and adding more is a relatively simple process (details in the creating vitae templates vignette). These templates leverage the strength of rmarkdown to include common information in the YAML header (name, position, social links…) and extended information in the main body. The main body of the CV is written using markdown, and allows for data-driven generation of entries using the *_entries functions. This allows you to import your working history from other sources (such as ORCID, Google Scholar, or a maintained dataset), and include them programatically into your CV. The package provides two types of entries from data, which are detailed_entries and brief_entries. Both functions provide sections for what, when, and with, and the detailed_entries additionally supports where and why. These arguments support operations, so for this example, we have used glue to combine the start and end years for our when input. Excluding any inputs is also okay (as is done for why), it will just be left blank in the CV. Add your vitae to the list using a PR. Please note that the ‘vitae’ project is released with a Contributor Code of Conduct. By contributing to this project, you agree to abide by its terms. Four CV templates: hyndman, twentyseconds, awesomecv, moderncv. Three CV entries functions: detailed_entries(), brief_entries() and bibliography_entries().